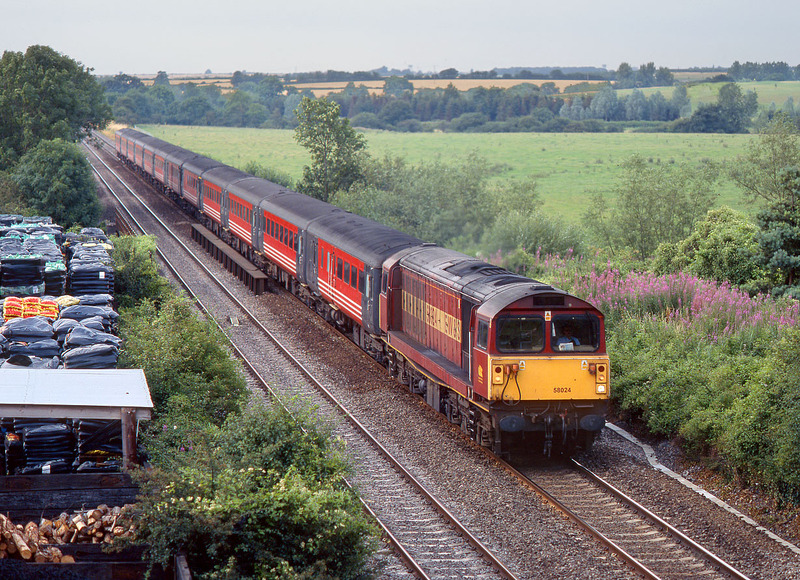 An unusual duty for a Class 58 on 22 July 2002. 58024 passes Bletchingdon (between Banbury and Oxford) with the 5Z10 16:57 Oxley to Didcot ECS move conveying ex Virgin Mk2 coaches 1204, 1208, 5900, 5975, 5999, 6059, 6061, 6120, 6172, 6184, 9507 & 9522 made redundant with the recent introduction of Class 220 Voyager units. Unusually for such empty stock moves, this was running exactly to time. An industrial estate now occupies Bletchingdon station site and the site of the former yard is now used for storage.